Something of sad news as it has been officially revealed via Facebook that WWE will no longer be airing on the cable channel FOX. 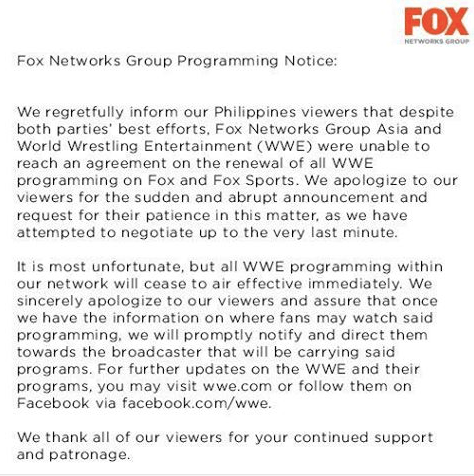 The cause for the pull out is a communications breakdown between FOX and WWE. I’m going to hazard a guess that this has to have something to do with money. After all, WWE Network’s current setup charges 9.99 per account meaning they’ll lose money if they stick with FOX. Fox on the otherhand couldn’t meet the pricing that WWE dictates. I’m again going to guess that they gave a price that would cover neatly the number of viewers of FOX, then prorated it to match what they stand to “lose” if all those viewers subscribed to the WWE Network instead. Here’s a screenshot of the sad note that FOX had to share to it’s fans of Facebook. Funny thing is a few months ago, I was very happy that they had returned and they even had a part in this “live event” FOX had to hype up LEGION.